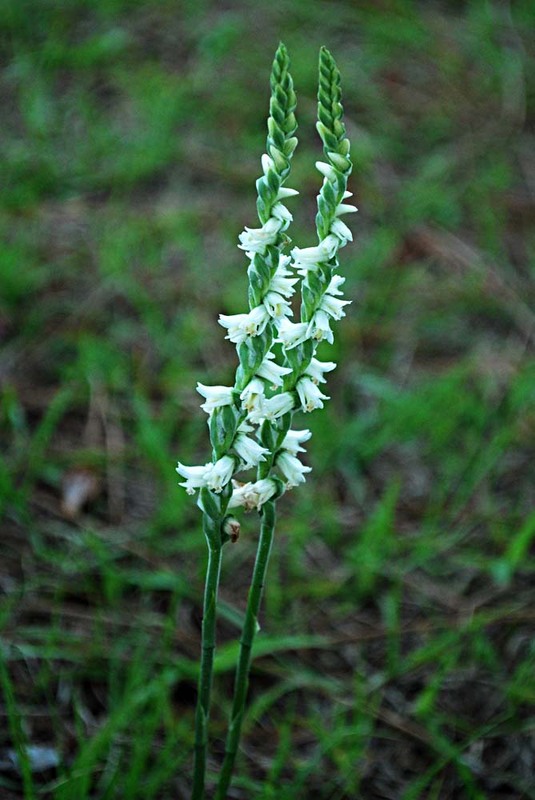 Yesterday I happened to notice two ladies'-tresses (or ladiestresses, as the USF/ISB online plant atlas calls them) growing near the volleyball courts. I didn't have my camera with me that day, so I returned around noon today ready to photograph them. It started raining just as I approached the flowers; then came close flashes of lightning. Standing under tall pine trees in a thunderstorm is not good, so I quickly fired off a few shots, some of them with flash since storm clouds had darkened the sky, and headed to my car for safety. 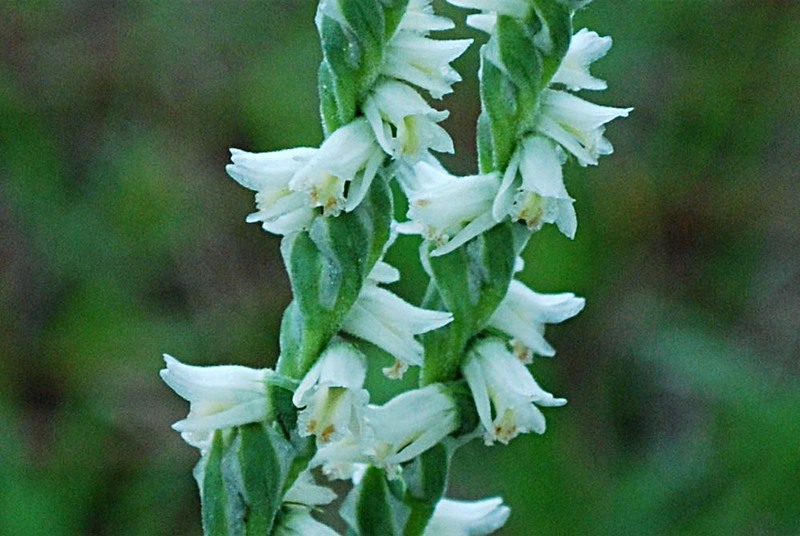 The primary characteristic of ladiestresses is the flowers usually form a spiral around the stalk, hence one of their common names, spiral orchid; the genus name is Spiranthes. 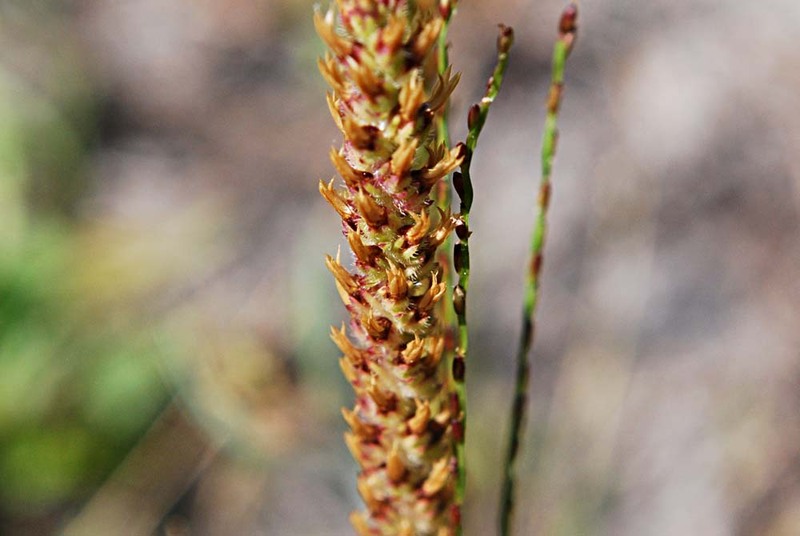 According to the USF/ISB online plant atlas, there are 22 species of Spiranthes in Florida, all of them native. 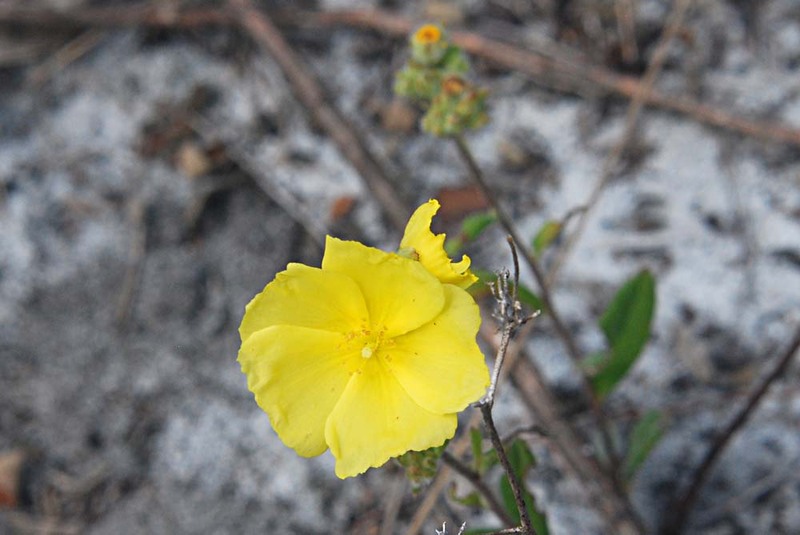 Five of the 22 species have been found in Brevard Co. 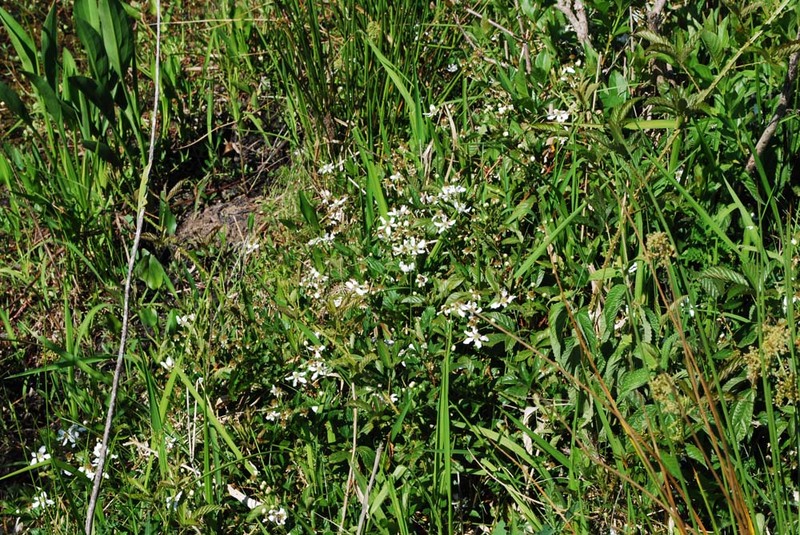 They are: S. laciniata, S. odorata, S. praecox, S. sylvatica, and S. vernalis. 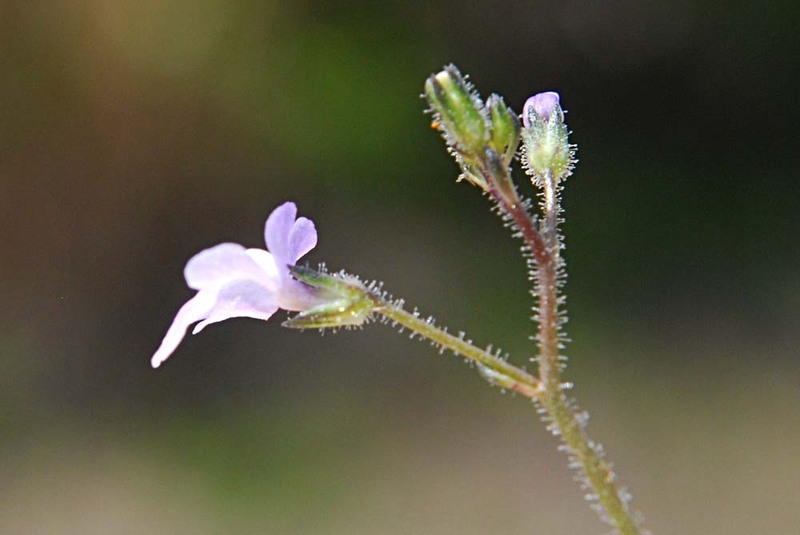 Of those, only S. praecox (greenvein ladiestresses) and S. vernalis (spring ladiestresses) are described by Wunderlin as common. Others were characterized as frequent, occasional, or rare. 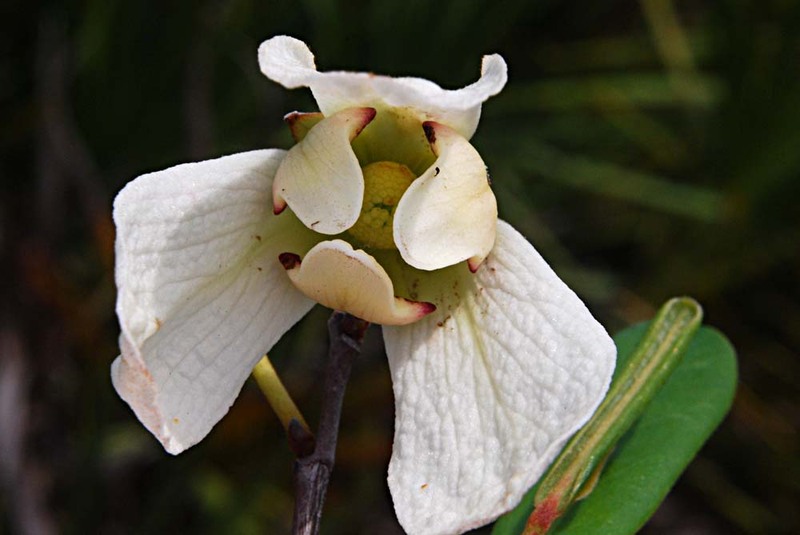 Both S. praecox and S. vernalis are found in similar habitats: wet flatwoods, marshes, and open, wet, disturbed areas. 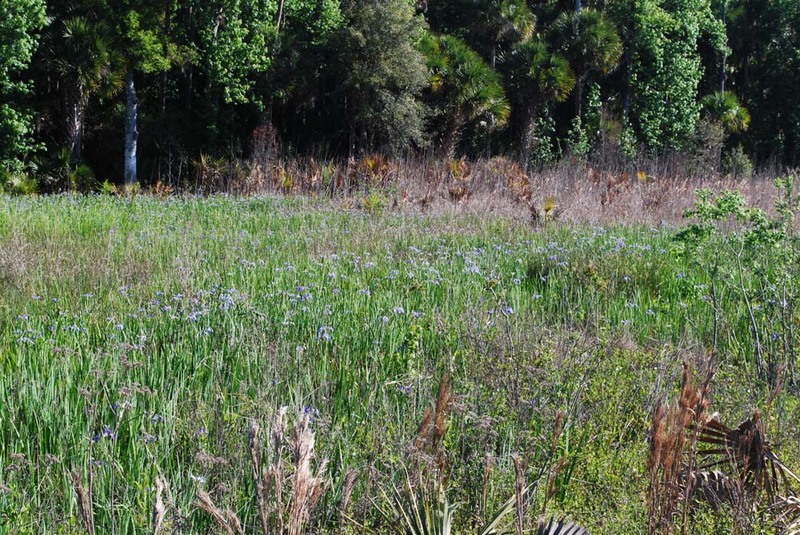 The area where I found the two plants was definitely wet flatwoods--the ground was squishy (it had been raining for the past several days) and the plants were in pine flatwoods. 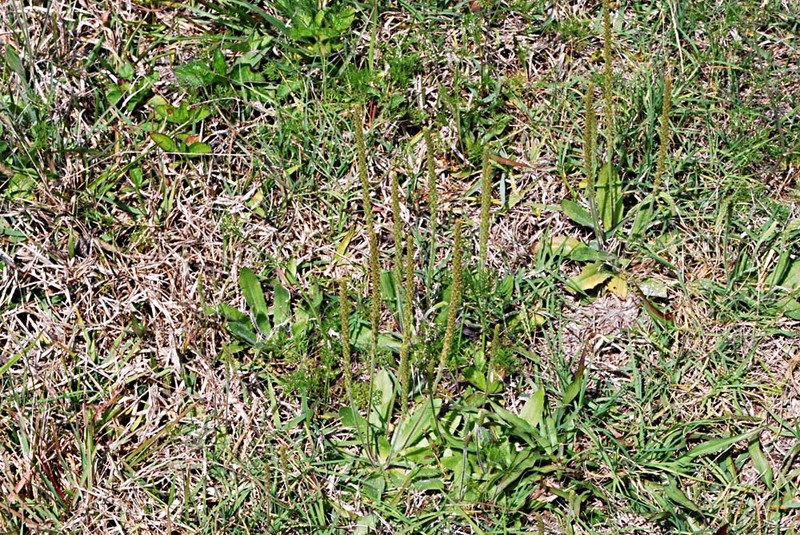 There were two clumps of the plant, about 1 ft. apart; one with two flowering stalks and one with four flowering stalks. 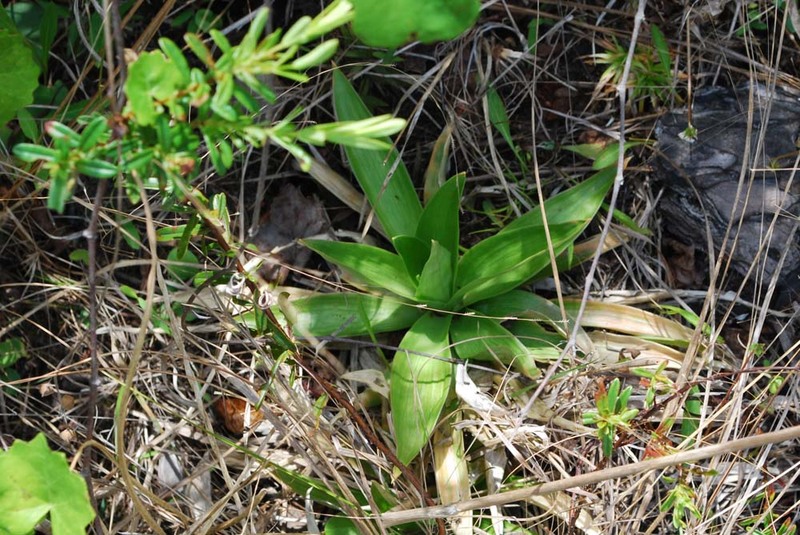 Basal leaves were grass-like. 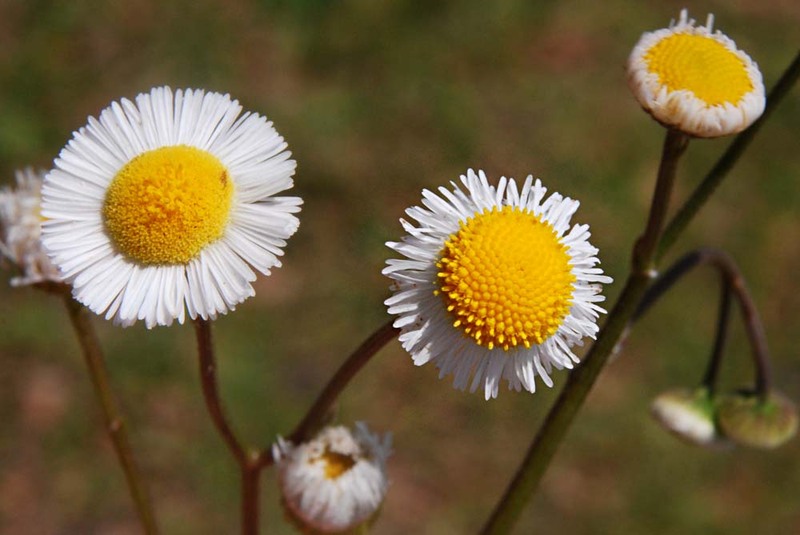 One online source stated that S. vernalis is distinguished from others in this genus by the "presence in inflorescences of copious articulate, pointed trichomes." 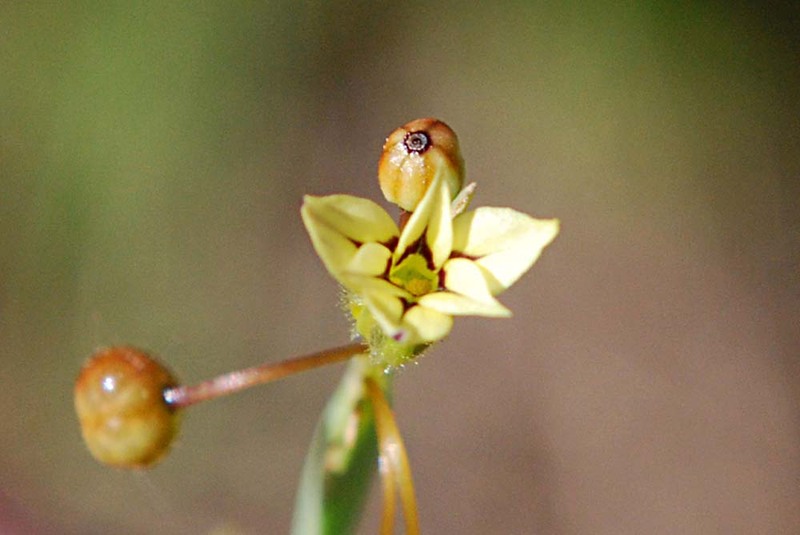 Another online source states that in S. vernalis sepals and petals clasp in a hood over the lip, which "often shows a pair of brown dots when it ages." The plants I found appear to have some fuzziness (i.e., trichomes) on the flowers and the lips show a pair of brown dots. Although my skimpy evidence points to S. vernalis, I didn't examine the plants closely enough to confidently identify the species. 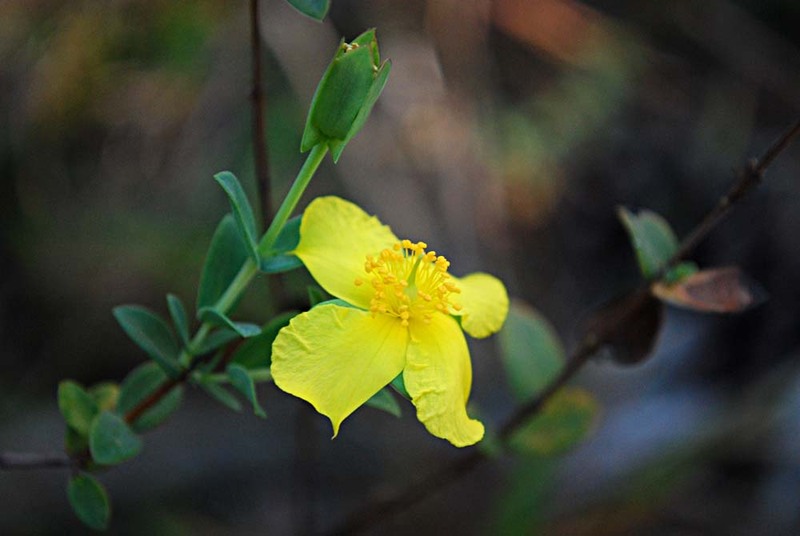 My son Pete suggested we visit Tosohatchee WMA to search for wildflowers. It's just over the Brevard Co. border, west of the St. Johns River. A sign at the entrance warned us of deep sand on the roads in the area and advised that only 4-wheel vehicles should enter. 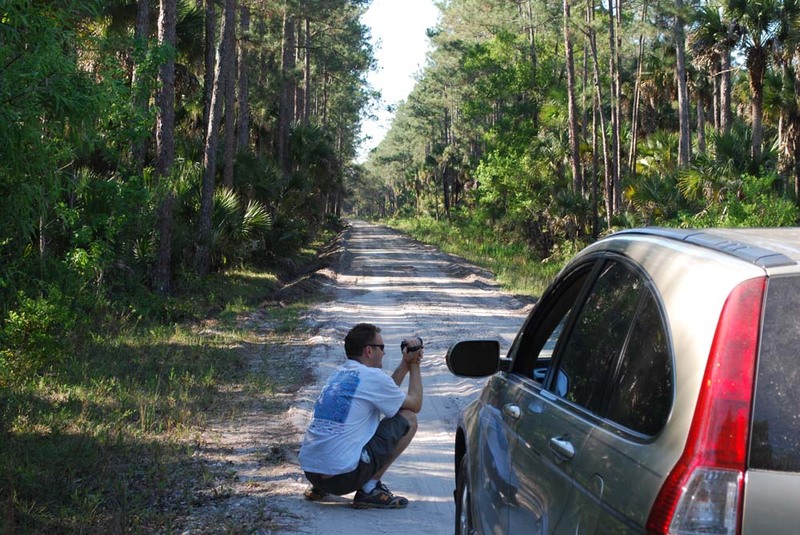 Although my vehicle is not 4-wheel drive, we drove on anyway and had no problems. I didn't photograph any birds, but we saw lots of red-shouldered hawks and black vultures, a few kingfishers, little blue herons, and a palm warbler; heard a pileated woodpecker, Carolina wren, and white-eyed vireo. 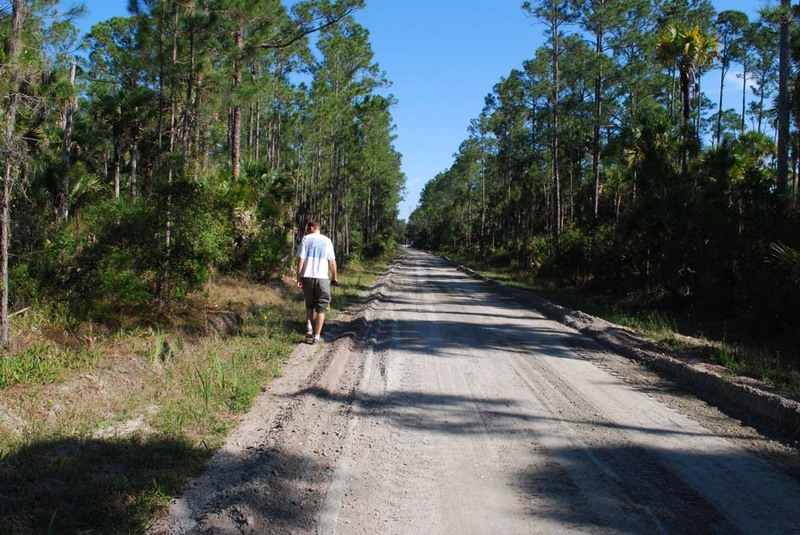 This is the main road through the WMA. 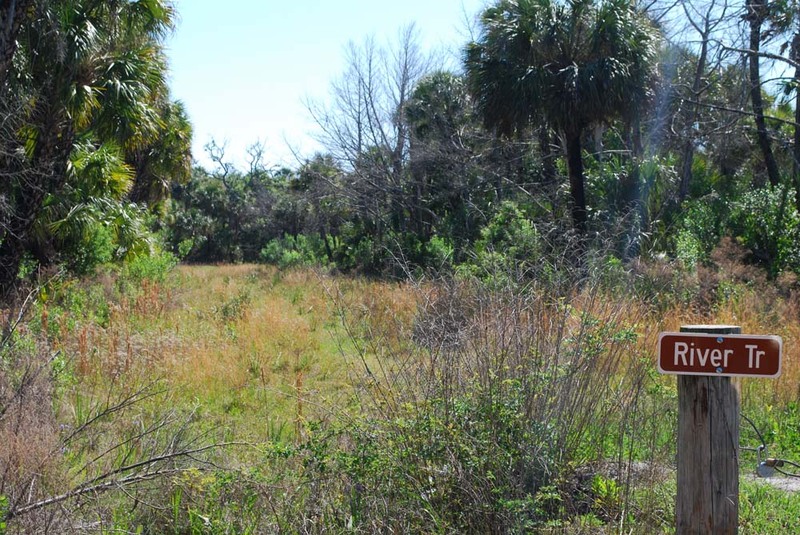 If runs from near the entrance (on Taylor Creek Rd) east to the St. Johns River. 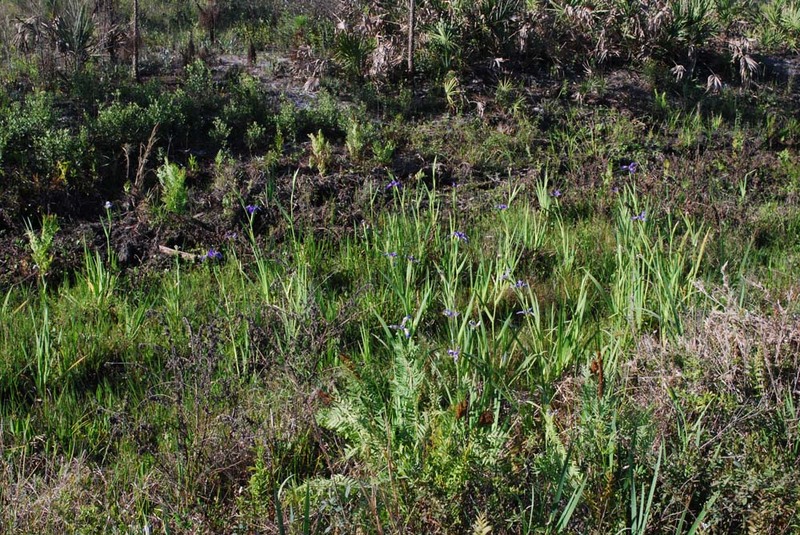 An online article about Tososhatchee WMA says "spring-blooming irises add swaths of color to the landscape." I wasn't expecting to see so many, though--mostly in ditches alongside Power Line Rd. 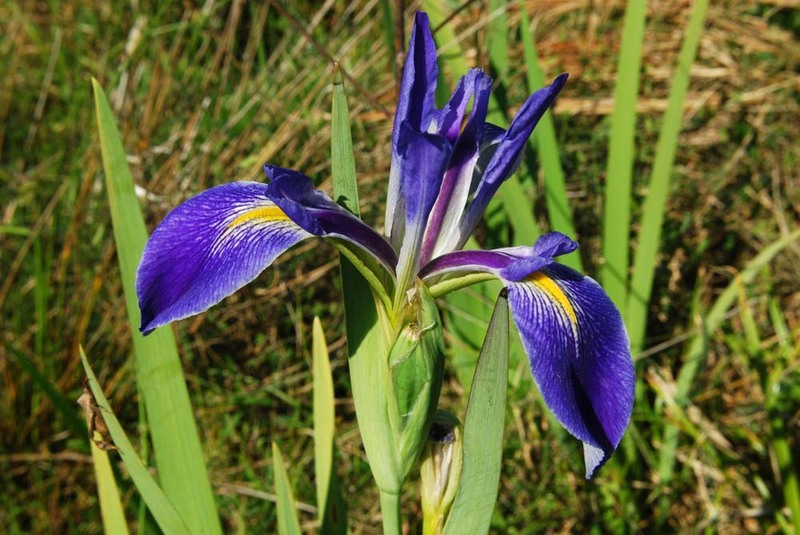 This is the only iris the USF/ISB online plant atlas shows for Brevard and Orange Counties. 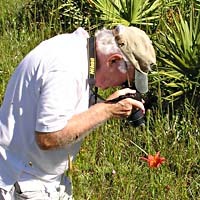 It is the most common iris in Florida and is widespread. 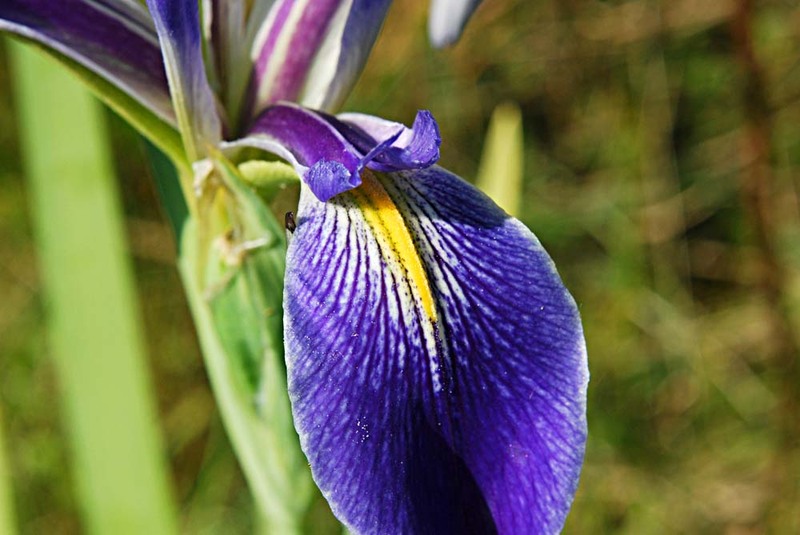 This is the first appearance of iris in this blog. We ventured a short distance off Power Line Rd a couple of times. 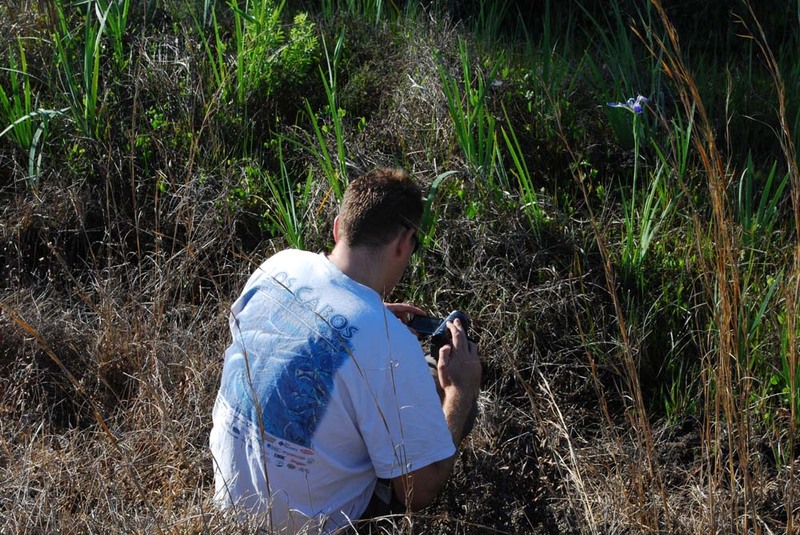 This gave us a chance to look through a few different habitats. The following seven items were found near our stop on Fish Hole Rd. This was a new plant for me. 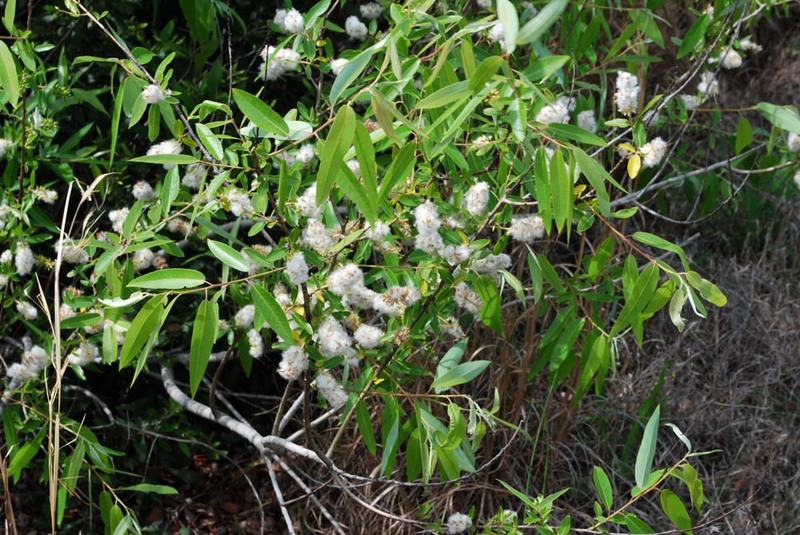 The shrub was growing in woods along the edge of a trail off Fish Hole Road. 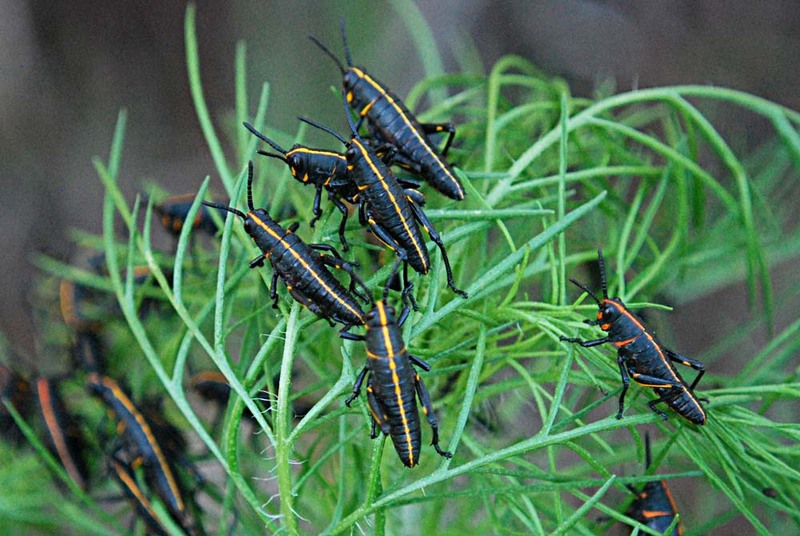 Pete found this gathering of lubber grasshopper nymphs feasting on fresh dogfennel. 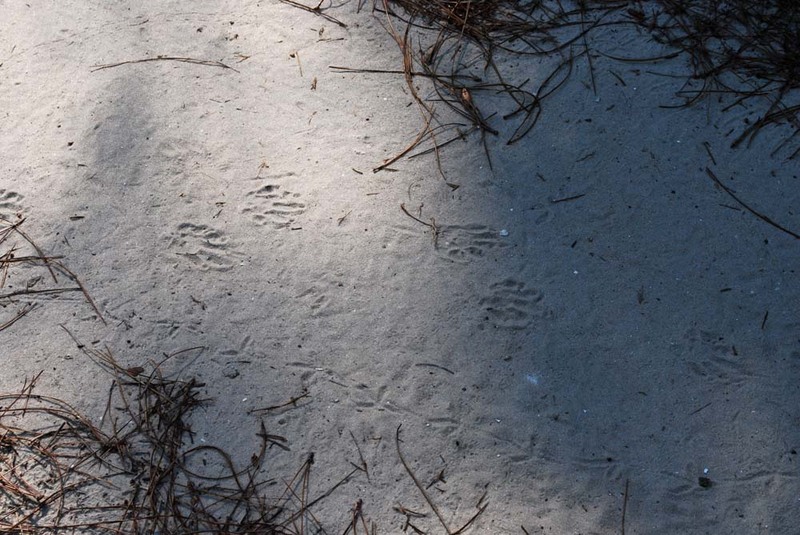 The top tracks look like racoon. The bottom one is probably a lizard. 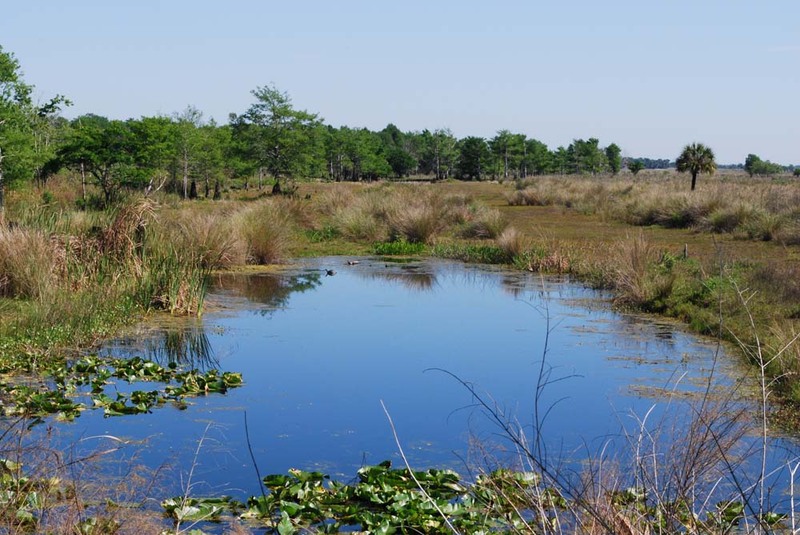 This small body of water with sunning turtles was at the edge of the St. Johns River plains. The trees in the distance are cypress, newly leafed out. 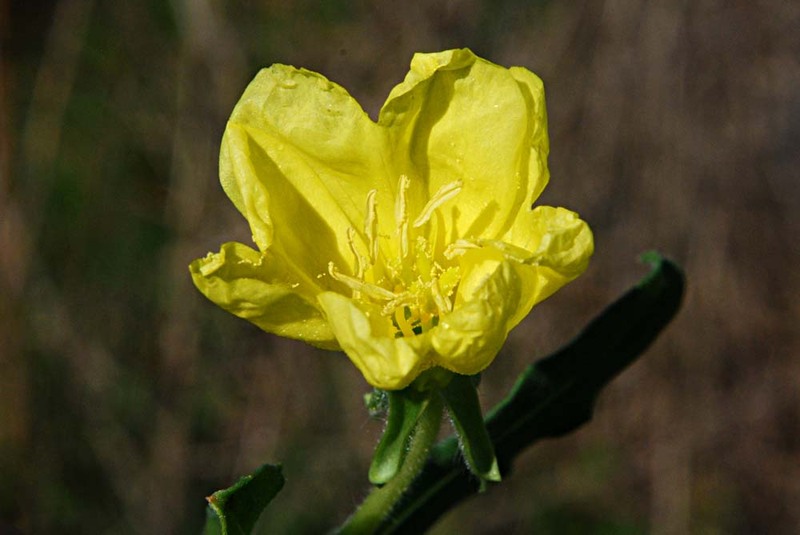 This is the first appearance of this wildflower in this blog. 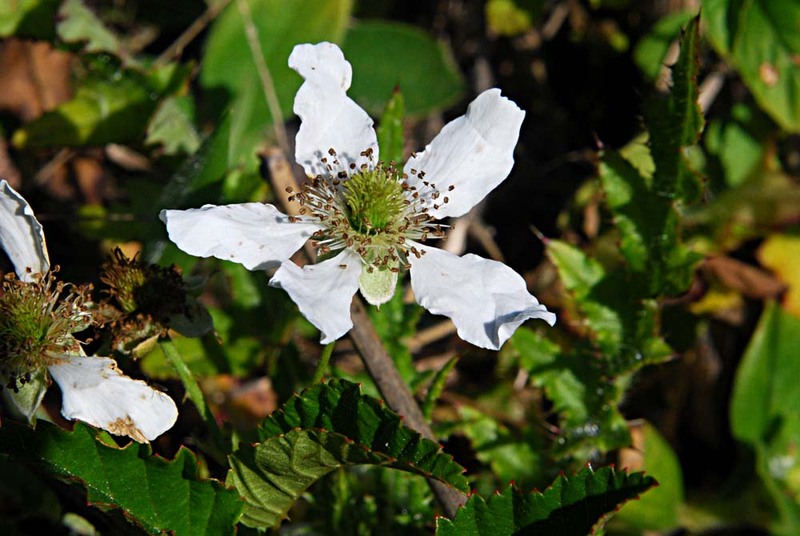 We found a blackberry bush that had an orange, powdery substance on the underside of its leaves. 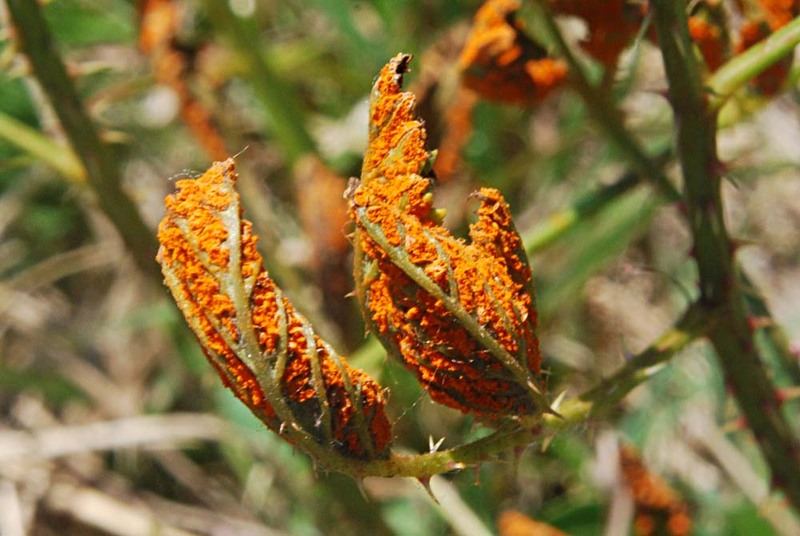 I later found that it was caused by a fungus called orange blackberry rust. We drove a short distance down Long Bluff Road to the entrance of River Trail. This was a very weedy trail with many familiar wildflowers. This was a surprise find. I had seen it only once before (in a mowed grass area in Wickham Park). 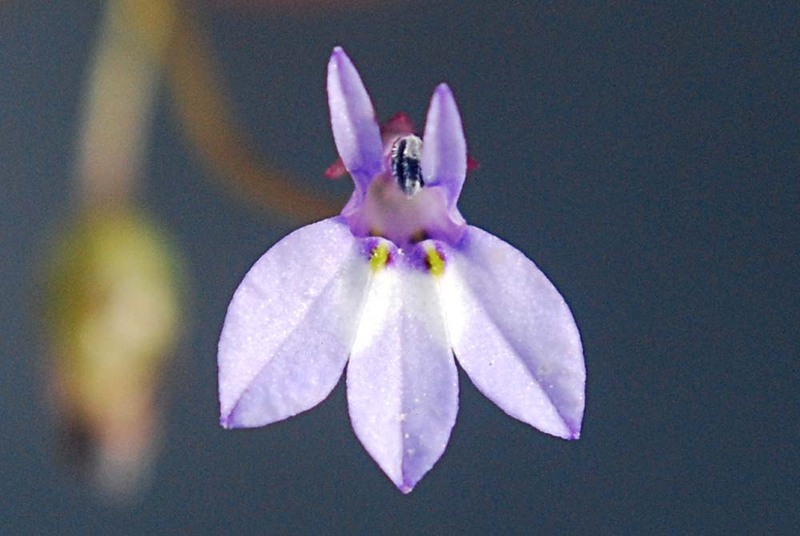 It's a tiny flower, a cousin of narrowleaf blue-eyed grass. 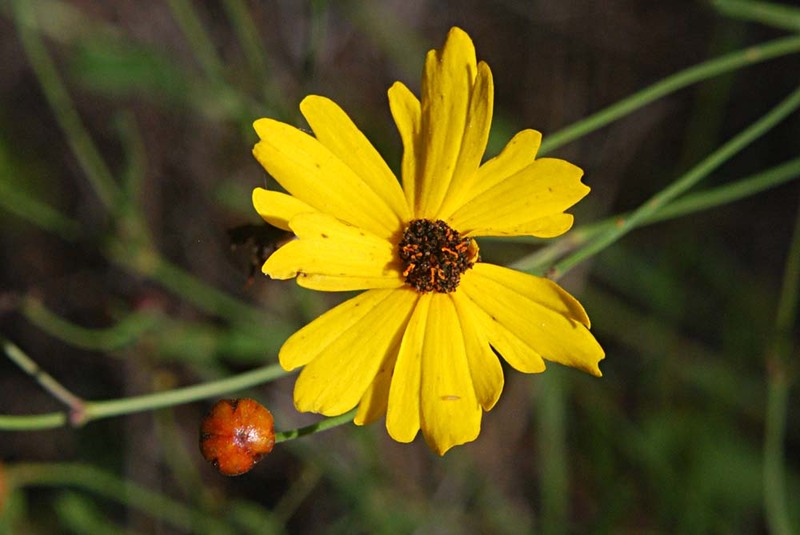 About half the photos at the USF/ISB online plant atlas show this flower as yellow and half as rose-colored. 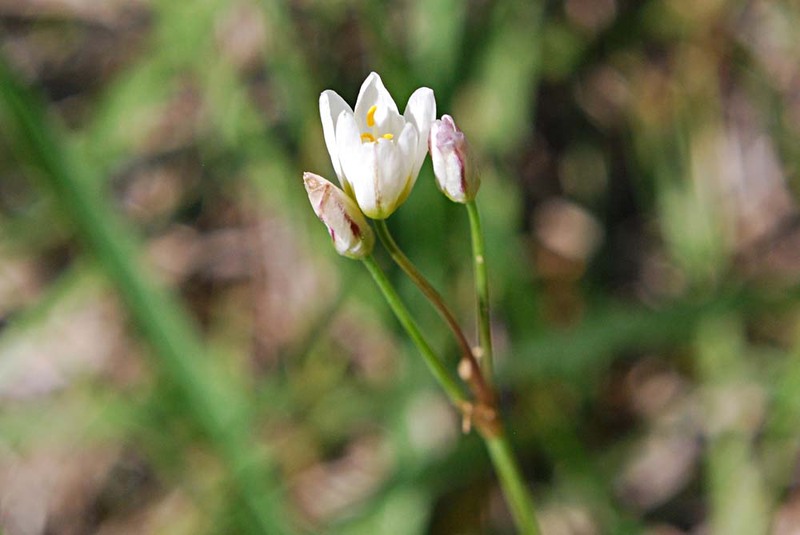 This is a small white flower, resembling a lily (6 petals). 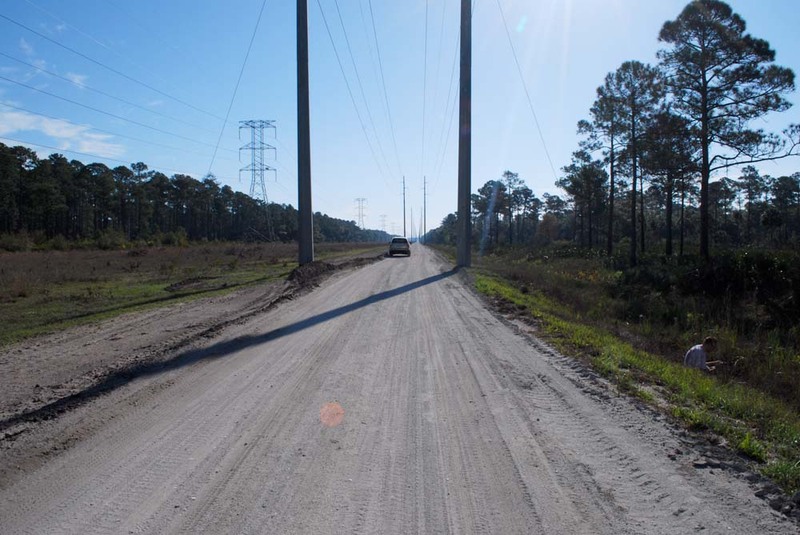 Power Line Rd. 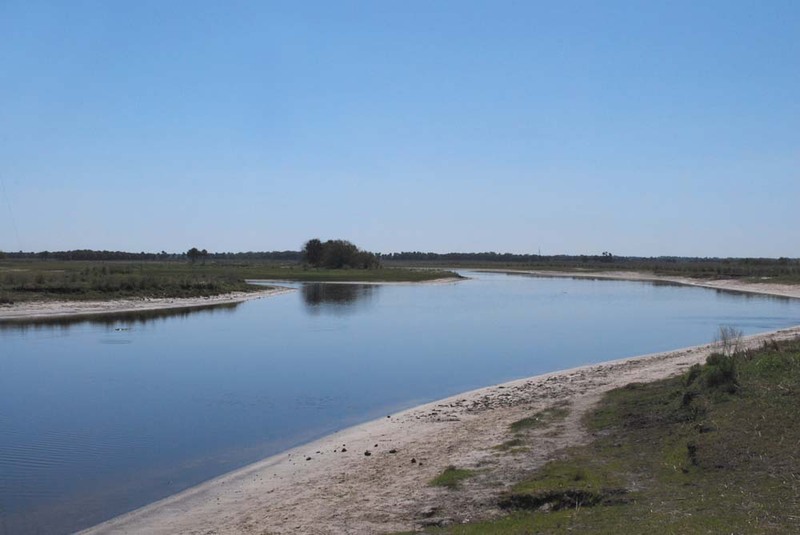 ends at the river, a popular fishing spot. 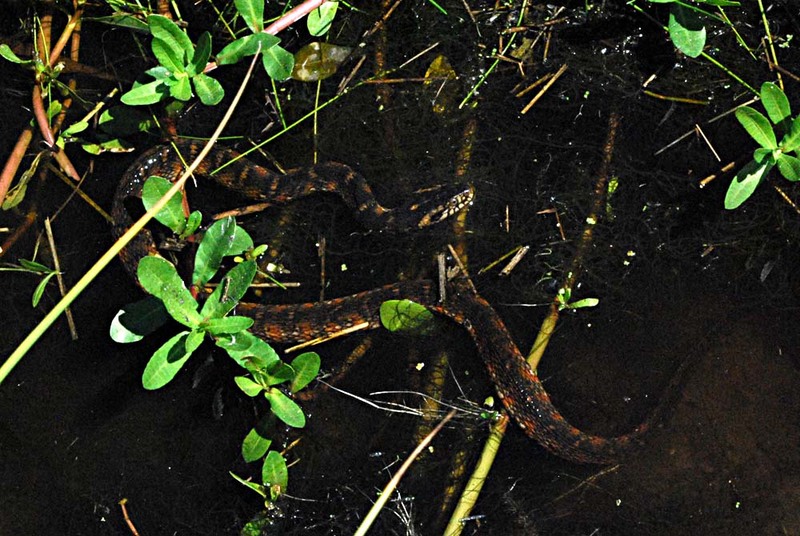 We stopped to photograph some yellow flowers and found this harmless snake in the water. 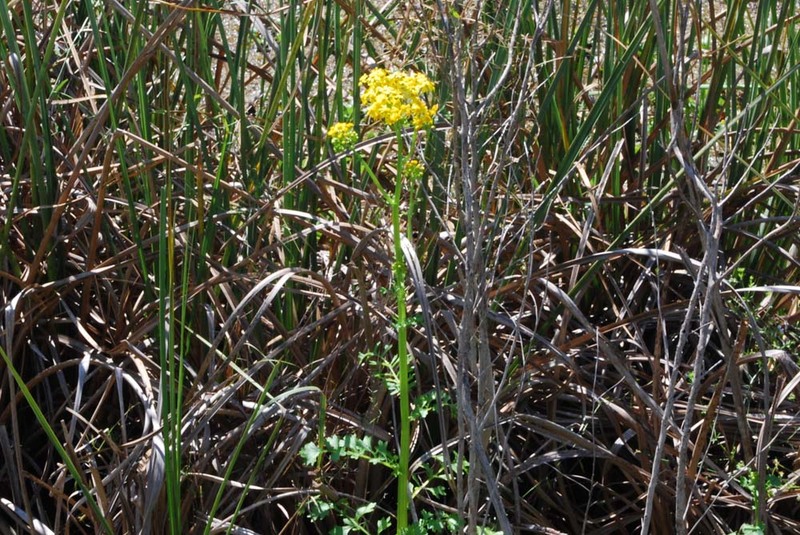 After the iris, butterweed was the showiest flower we saw. 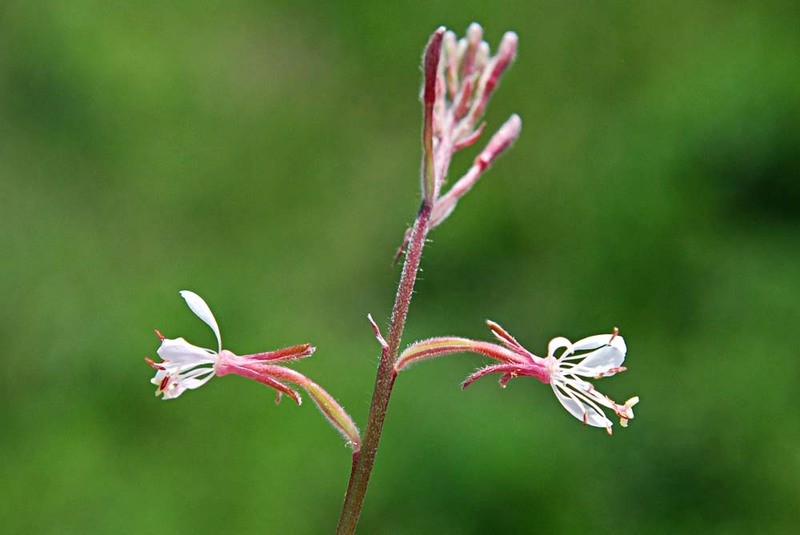 It's a fast-growing, succulent plant. 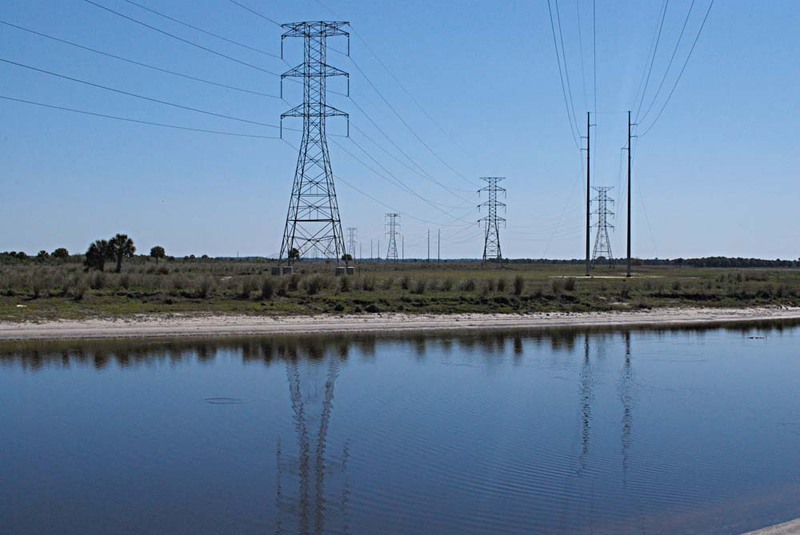 On the way back home, I stopped and took the bottom photo in a field near the intersection of I-95 and SR 520. 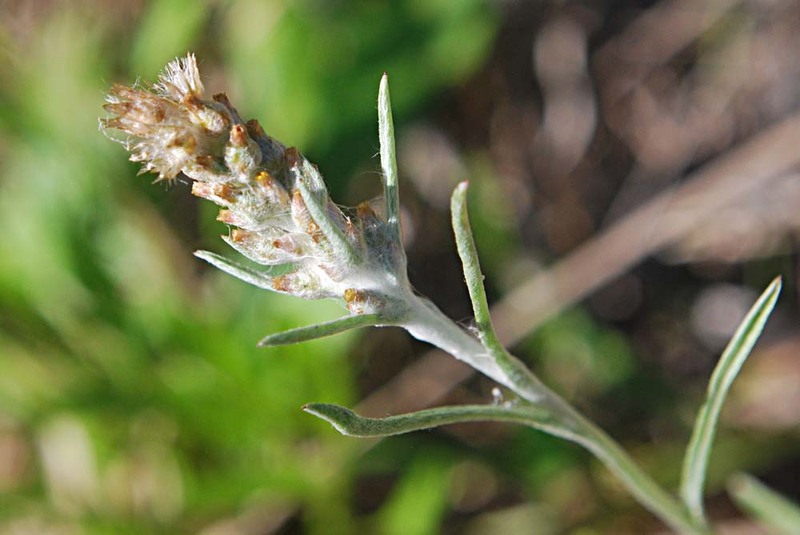 This is the first appearance of buttereweed in this blog. 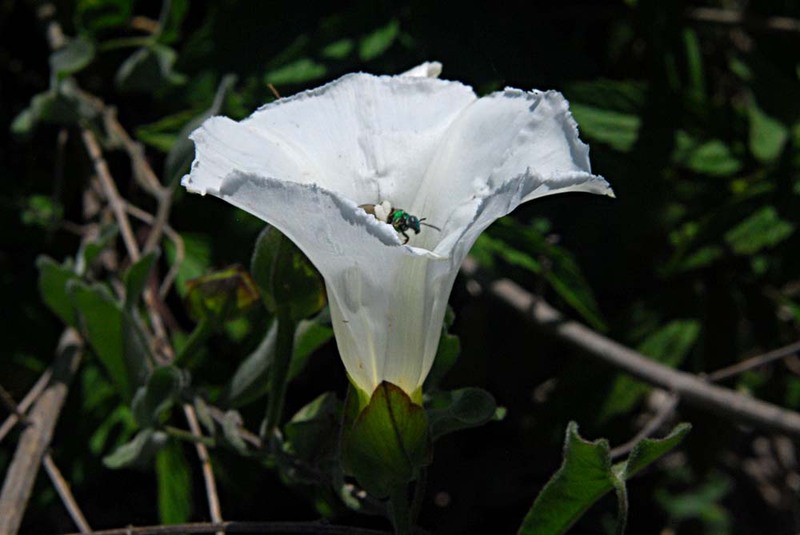 I took a quick hike around my favorite wildflower spots to see what was blooming. 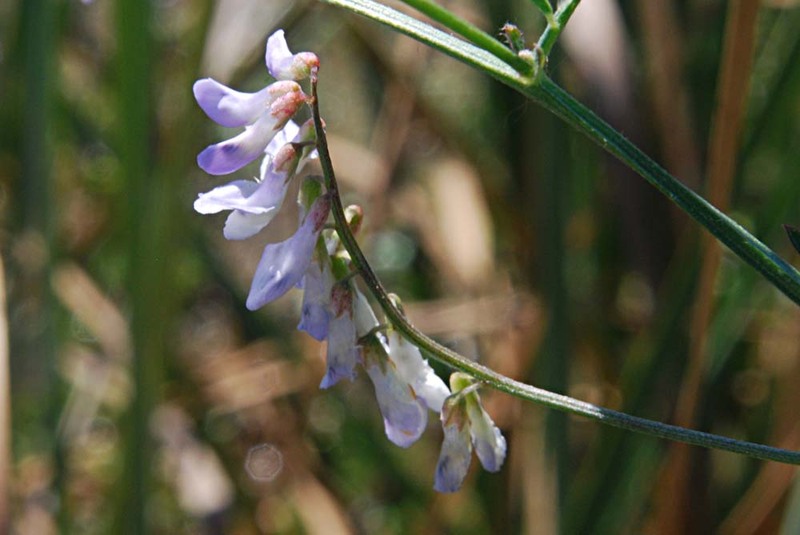 Found one wildflower new to me: Fourleaf vetch. 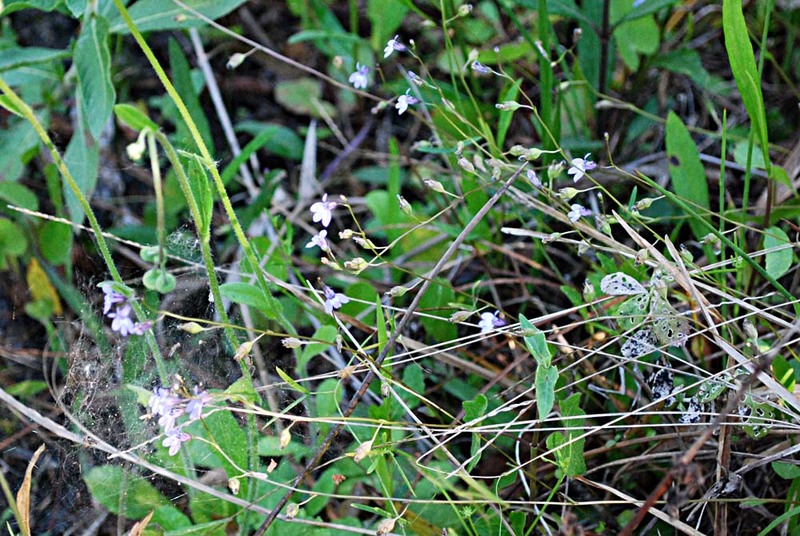 Also, found two wildflowers that I had not seen in Wickham Park before: Apalachicola toadflax and Virginia plantain. 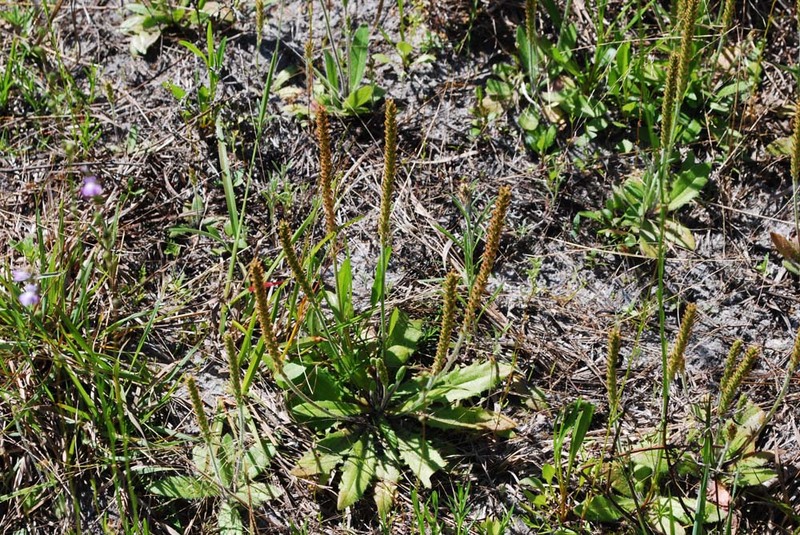 The plantain is a very common "weed," which I must have overlooked on previous visits. 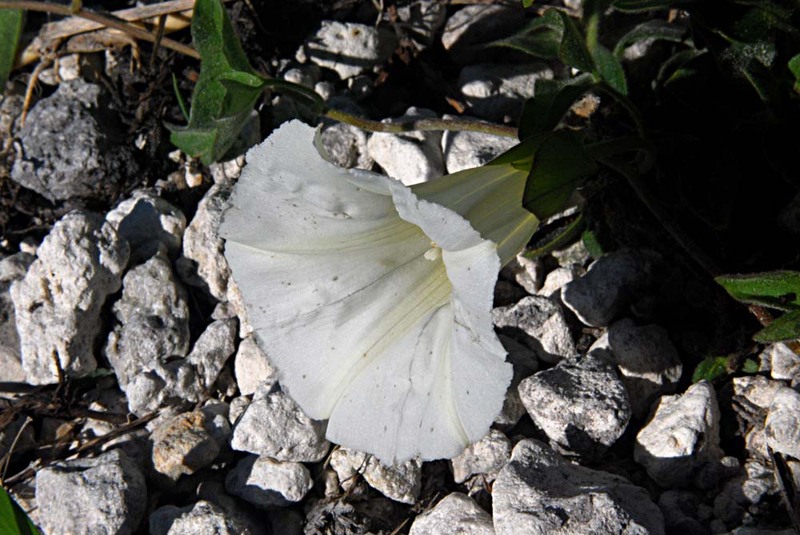 Following are photos of some of the wildflowers I found on this day. After the photos are listed other blooming plants seen, some non-blooming plants, and a few common plants that I did not find (too early). 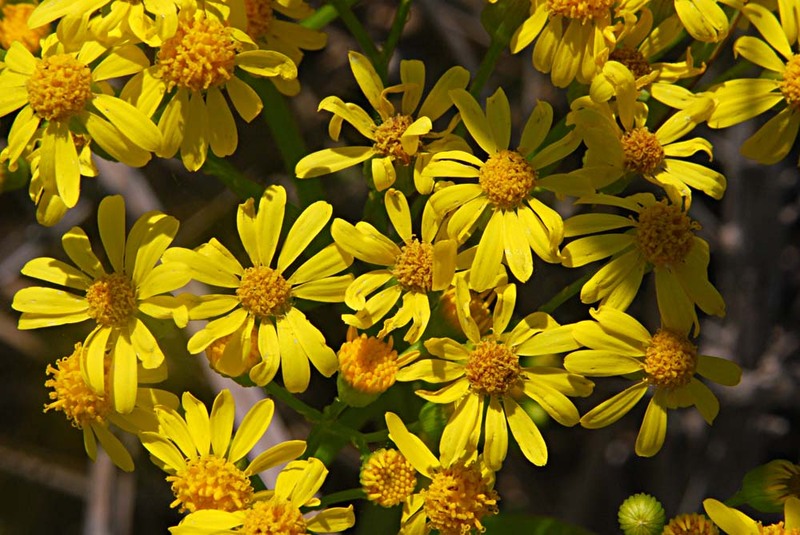 Plenty of it blooming throughout the park, especially along roadsides and ditch shoulders. One small patch found along the ditch to the Youth Camping Area. 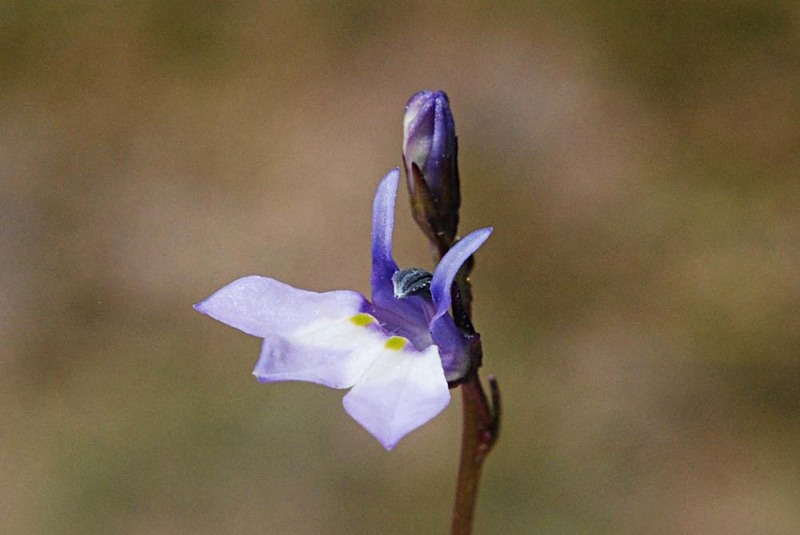 Several other ditches in the park have patches of bay lobelia. Lots of pawpaw in bloom. Large patches along the ditch to the Youth Camping Area. This wildflower was new to me. Found along the ditch to the Youth Camping Area. It's probably been there all the time, I just overlooked it. 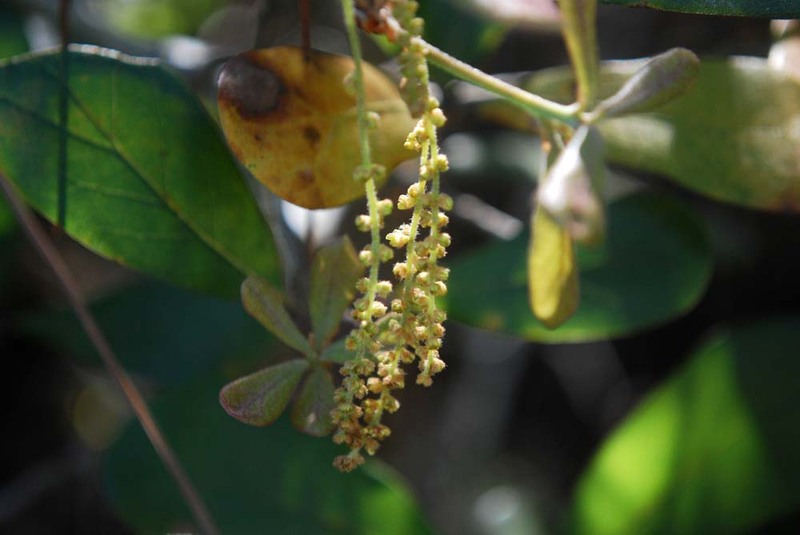 The side view on the right shows the corymb structure of the inflorescence. 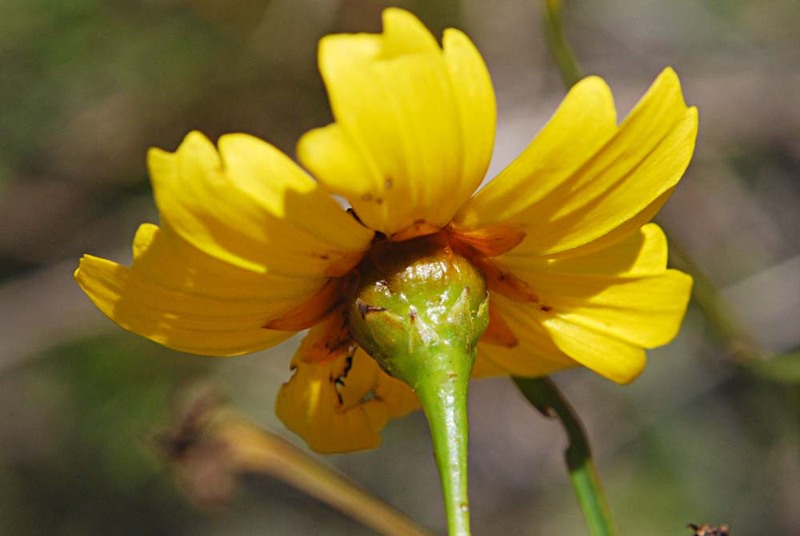 It also shows the bug that had eaten half of one of the blossoms. 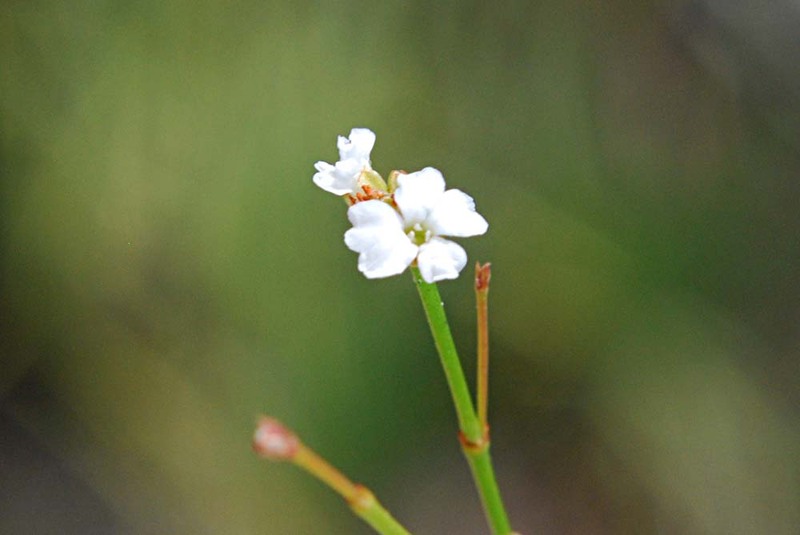 I found only a few of these tiny plants in bloom. A surprise! 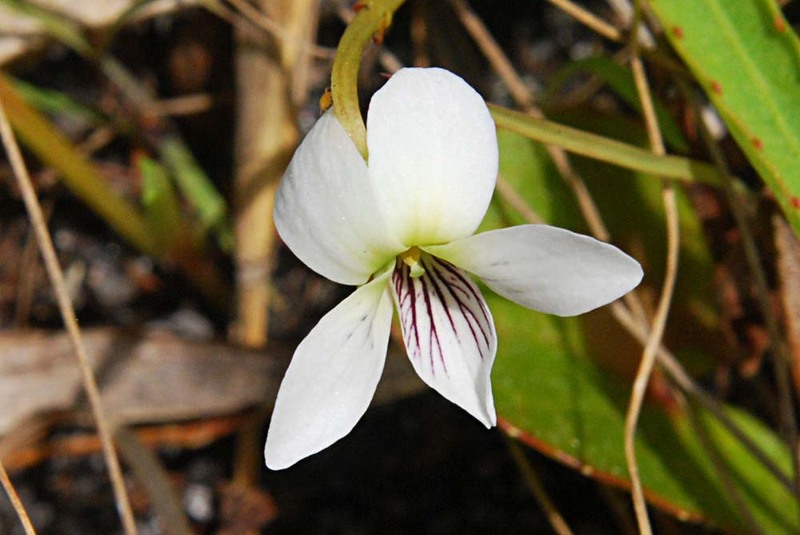 In spite of the dry conditions, lots of white violets were growing where they always do. Found a willow tree with female catkins that had turned to fuzzy seed heads. 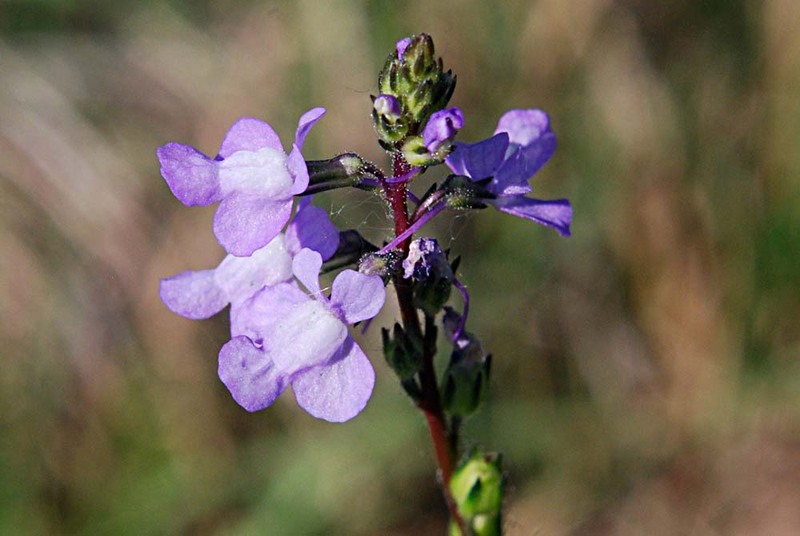 The other toadflax is Canada toadflax, L. canadensis, which is commonly seen along roadsides. 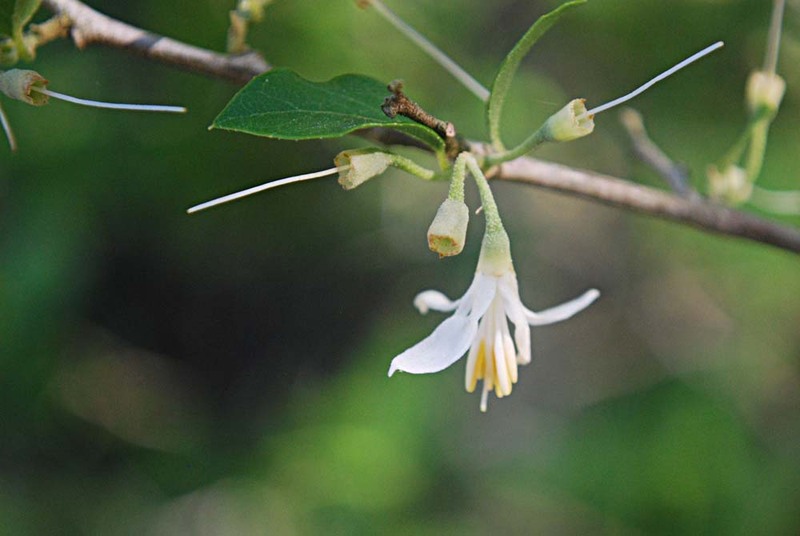 It has short flower stalks, blossoms with long spurs, and smooth stems. 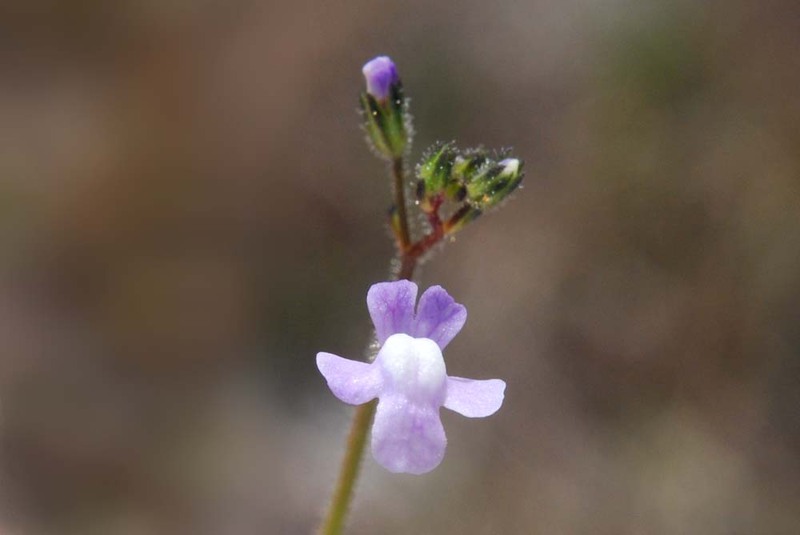 The toadflax shown here, L. floridana, has glandular/pubescent stems, long flower stalks, and short spurs. 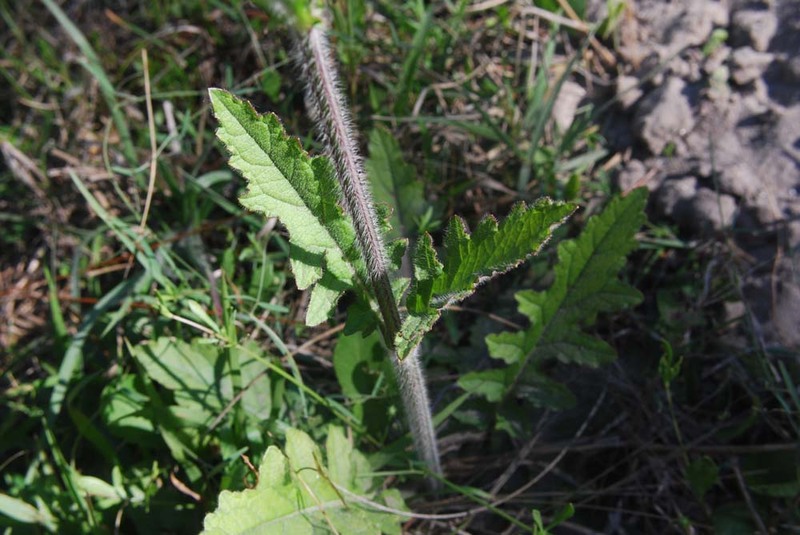 This wildflower is easily identified by its basal leaves, shown here. 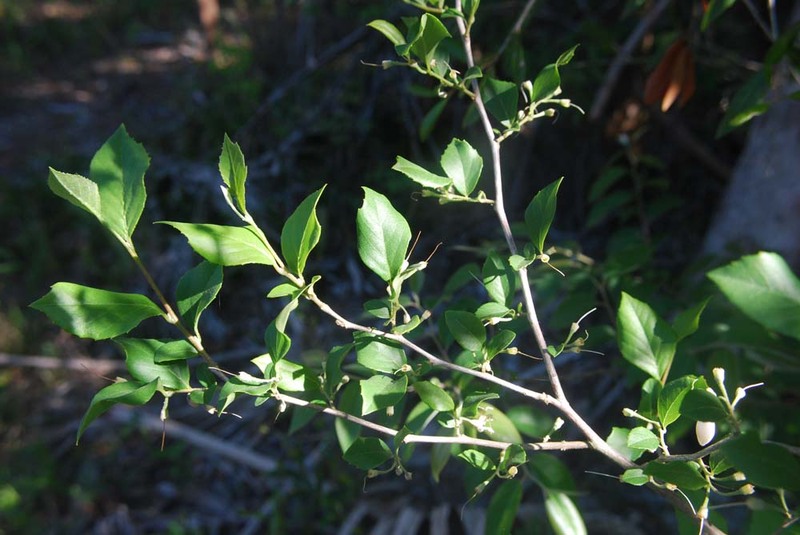 The leaves are pointed, slightly rolled up, and yellowish. I believe the flower stalk will appear in May and will turn to seed by early June. 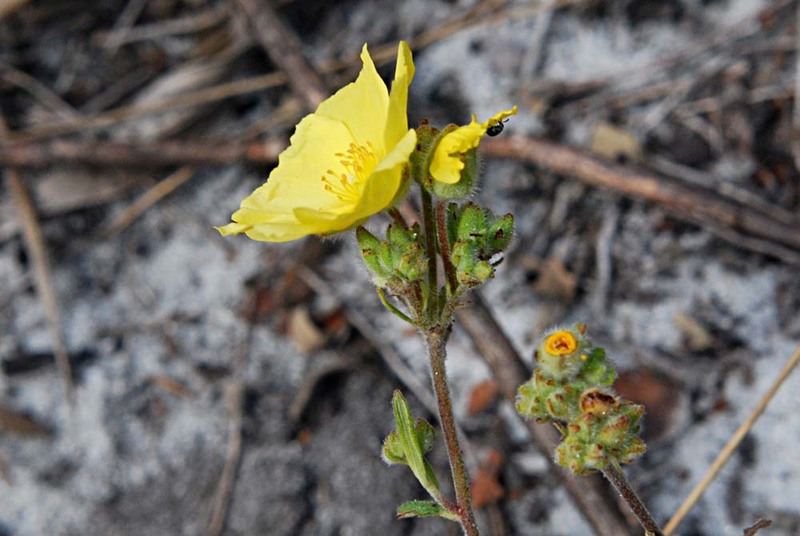 There are only two or three plants in this area (the boggy area north of the Youth Camping Area), and these are the only ones I've ever seen anywhere. Other wildflowers in bloom, but not shown in this post: fourpetal St. John's-wort (lots of it), blackroot (a few), pennyroyal (appeared to be mostly bloomed out for now), rose-rush (found only one in bloom), yellow stargrass (lots of it in grassy, mowed areas), beeblossom (found only one plant), black medick (lots), yellow oxalis (a few), Mexican clover (lots), hawkweed (only two), camphorweed (found 1 short one in bloom, lots of them just coming up), and fetterbush (several plants in full bloom). Wildflowers not in bloom: Adam's needles, shiny blueberry, creeping oxeye, Caesar weed, rusty staggerbush, elephant toes, tarflower, prickly pear, winged sumac, and beargrass. 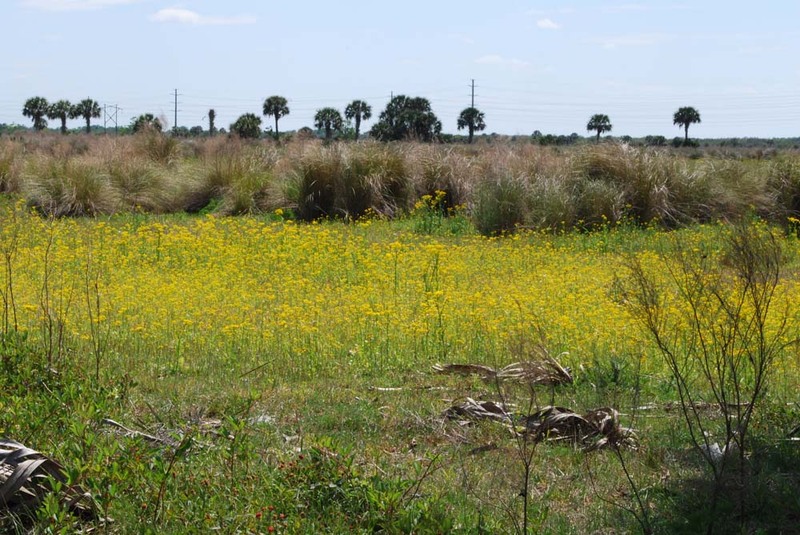 Some plants not found, but are usually present later in the year: palafox, blue mistflower, rosy camphorweed, yellow milkwort, coastalplain St.John's-wort, savannah milkweed, Florida milkweed, roseling, meadowbeauty, and sundew.